Hilly, with a mix of woods and partially open holes. Demanding fairways favor well placed shots. This course uses the old final nine of the original Black Locust and nine new holes. Next to large beach with many facilities. Fees as of 2018: Park entry: $10/car/day, $35 annual decal. Disc golf fee: $3/day or a $55 Annual DG Bag Tag (seniors 62+, juniors under 21 $35). I-96 west from I-275 or east from US-23 to exit 153 (Kent Lake Rd). 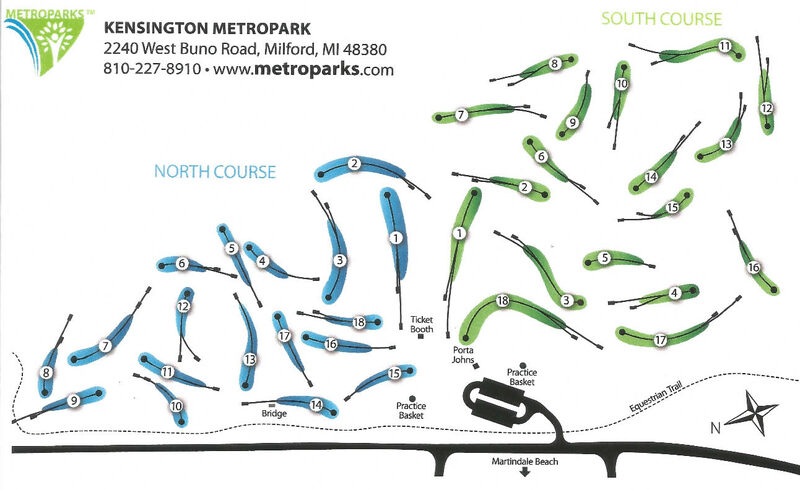 Enter the park north of I-96 and go to the 1st parking lot on the right. 1st tee to the right of booth where you pay to play. Camping with modern bathrooms and private showers available 15 miles away at Brighton State Recreation Area. Have you played at Kensington Black Locust - Green? Be the first person to review this course!